Mighty Rock (No. 5) driven by Ryan Holton, noses past Feelin American (driven by Dan Noble) to win the D.E. Mossbarger Fayette County Classic Saturday, July 22, 2017 at the Fayette County Fair. 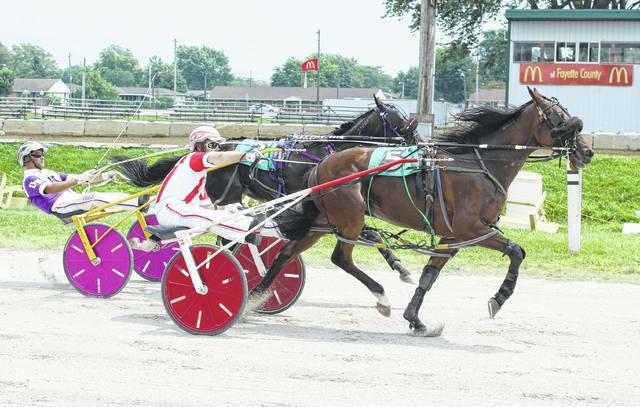 On a sweltering Saturday afternoon, there were 14 harness races held at the Fayette County Fair. The featured race, the annual D.E. Mossbarger Fayette County Classic, was won this year by Mighty Rock, driven by Ryan Holton, finishing in a time of 2:03.4. It was a close race, as Mighty Rock edged Feelin American, driven by Dan Noble. The following are the results of the races for July 22, 2017.
https://www.recordherald.com/wp-content/uploads/sites/27/2017/07/web1_Might-Rock-wins-2017-Fayette-County-Classic.jpgMighty Rock (No. 5) driven by Ryan Holton, noses past Feelin American (driven by Dan Noble) to win the D.E. Mossbarger Fayette County Classic Saturday, July 22, 2017 at the Fayette County Fair.